Set includes a 6 ft X 1 in white reinforced fiberglass pole, a heavy duty cast aluminum bracket with thumb screw to secure pole in the bracket. This bracket can be mounted with screws or stainless steel strap (not included). A gold, heavyduty plastic final for long lasting beauty. 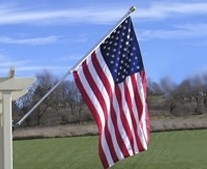 Add a 3' X 5' high quality header and grommeted US flag with sewn stripes and embroidered stars to your order.